Sabzevar Airport (Persian: فرودگاه سبزوار‎) (IATA: AFZ, ICAO: OIMS) is an airport in Sabzevar, Iran. ^ "WORLD AERO DATA - SABZEVAR NATIONAL". Retrieved 9 November 2015. 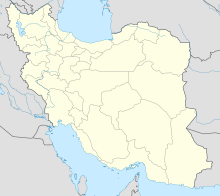 This Razavi Khorasan province location article is a stub. You can help Wikipedia by expanding it. This page was last edited on 2 January 2019, at 13:25 (UTC).